After spending a YEAR IN SPACE‬, astronaut Scott Kelly and cosmonaut Mikhail Kornienko return to Earth on March 1. NASA Television coverage will begin Feb. 29, when command of the International Space Station is handed over to astronaut Tim Kopra. 10:15 p.m. -- Deorbit burn and landing coverage; deorbit burn scheduled at 10:34 p.m., with landing at 11:27 p.m.
Talk will highlight the path that Christina took from growing up in North Carolina to becoming an Astronaut, the Astronaut Candidate training she recently completed, and how NASA’s Human Space Flight plans involve Astronauts as a part of the search for life beyond our planet. Even before she became an astronaut, Christina Koch lived a life of exploration and adventure.She has worked in remote research labs in frigid Barrow, Alaska, and tropical American Samoa. She has spent several seasons in Antarctic research stations, including one during the southernmost continent’s sunless winter. While there, in addition to her scientific and engineering duties, she was a member of the firefighting and search-and-rescue teams. And if that’s not enough, she’s also an award-nominated inventor. Her journey to adventure and accolades, however, started in eastern North Carolina – in Jacksonville, where the Michigan-born Koch grew up. She went to the School of Science and Math and then N.C. State University, where she earned three degrees in five years. 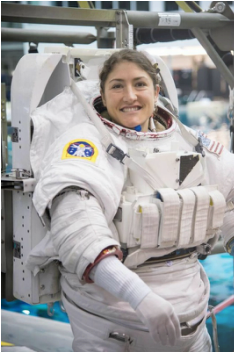 Saturday, as part of Raleigh’s Museum of Natural Sciences’ Astronomy Days, she comes home to North Carolina to talk about her career path, her recently completed astronaut training, and how NASA contributes to the search for life on other planets.